I never need an excuse to head off for a few days to wind up in glorious South Devon. This latest outing had a purpose though, not just a jolly. I was on a mission to see if guests staying in various lodgings along the South Devon coast (a location within the book) would be interested in Dance with Fireflies. Armed with boxes of books and my new dinky flyers, a two hour drive found us in the heart of the English Riviera, Torquay. Husband and wife team, Nicola and Steve always offer us such a warm welcome at The Buckingham Lodge Guest House. Nicola was happy to display my novels in a cabinet for her guests to see on arrival. The leaflets will be placed in all of the 8 guest rooms. So after a hearty breakfast (best in Torquay), and a great nights sleep, we pack up the car and head off into the misty morning (it was supposed to be sunny!). A short drive along the coast to the sheltered haven of Babbacombe Bay finds The Cary Arms and Spa. It nestles snuggly into this charming cove with amazing views out to sea. I have high hopes for my book in this beautiful boutique hotel and happily picture their clientele enjoying the story of Phyllis living in Devon during WW2. After a bracing walk along Babbacombe’s pretty harbour wall. We make our way to Shaldon. I love this cute little seaside village with its red sand river beach and jaunty rock called The Ness. I always picture Phyllis (my grandmother and protagonist of Dance with Fireflies) and the family living here, pushing the piano along the pavement to get it home, the bomb falling near the green and the telegram boy arriving on the doorstep with news of my grandfather’s death. Lunch at The Ness (fish and chips) was delicious as we peered out through large windows to the lovely view of Teignmouth over the water. The Ness is a handsome pub with lovely rooms that have the most charming balconies. Rachel, the manager, was thrilled to hear that her pub actually features in my book. The last of the day’s sunshine found us in The Langstone Cliff Hotel, Dawlish Warren. This traditional family run hotel overlooks the Exe estuary with amazing sea views from their expansive lawn dotted with tables and chairs. This is a proper hotel with Jazz and dance weekends, afternoon tea in The Lincoln bar and two swimming pools. I am very excited to have signed copies of my book on sale here….thanks to Louise… the granddaughter of its founders Stanley and Marjorie. So a great weekend. 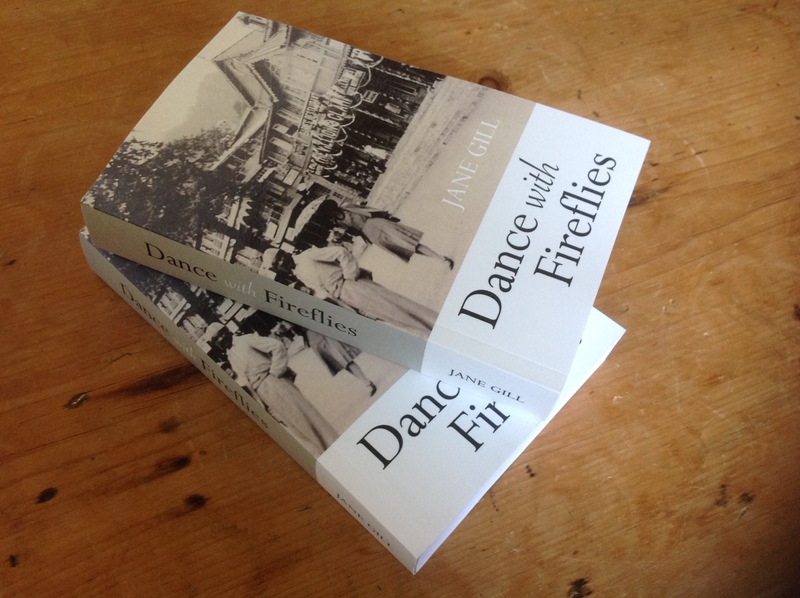 Dance with Fireflies has 4 more stockists, from a B&B, boutique hotel and spa, traditional pub to a long-established hotel. The summer of 2018 may seem like a long time ago now but I have just received these gorgeous photographs and simply had to share them. My mother, Maureen, was invited to a meeting by the Bookworms Book Club. They are a group of book lovers belonging to the Cam & Dursley U3A. They chose Dance with Fireflies as one of their summer reads. I just love the setting of this book club meeting, in the stunning gardens belonging to Jo, one of the U3A members. The tablecloth, pretty glasses and umbrella could easily be a scene from the book, some of which is set in the days of the decaying British Raj in India. Mum (in the white top) enjoyed sharing the family photograph album with the group who avidly searched out family members they felt they knew through reading the novel. “They discussed them as if old friends,” commented mum, who said she felt privileged to be the centre of attention. Mum received a lovely letter….the answer to which is…Yes! the sequel is written. I’m on the prowl for the right publisher. Watch this space. A compliment from Vikram Seth…a moment to treasure. So last night I met the amazing Vikram Seth after an enlightening session at the Oxford Literary Festival. What struck me was not only his total passion for the written word, be it novels or poetry but also his warmth. He indulged me in a lengthy conversation and even complimented me on the title of my novel (Dance with Fireflies) which I gave to him, despite a snaking queue of people wishing to speak with him. He asked me to dedicate it to him as he was signing my copy of A Suitable Boy….what a great moment! I was lucky enough to hang about for a while and felt hugely pleased to see him rest his arm on my book throughout the whole signing process. As we sped back to Burford that evening to enjoy one of my husband’s birthday treats …a night at The Golden Pheasant, I prayed to the stars that Vikram would at least flick through my book, if not read it. I can’t wait for A Suitable Girl….published later this year . A Suitable Boy, a suitable read. Time for some reading! I find it quite hard to read when I’m immersed in my own writing. I don’t want my characters to blend unintentionally with others. I need full concentration on my own storytelling. So I am feeling a little lacklustre regards my reading of late. I did manage Nutshell by Ian McEwan, but it was pretty short. Having just completed Book Two, I feel able to step away from the keyboard and look outside. I’m incredibly excited to be attending The Oxford Literary Festival to see Vikram Seth at the Sheldonian Theatre in Oxford. I am ashamed to say a previous attempt at Seth’s long novel (a massive 591,552words…equivalent of 5 Dance with Fireflies!) stumbled half way through. Second time lucky… I may be some time!